Dry hull weight. . . . . . . . . . . Speed. . . . . . . . . . . . . . . . . . . This fun boat is suitable for anything from island camping to offshore fishing. 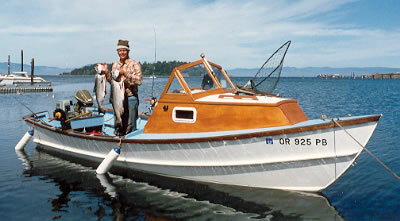 This 21' Dory is our most popular boat, and for very good reasons. She's an economical, beautiful, versatile craft, and she's big enough to handle the worst weather you'll encounter in inland waters. Performance is exceptional throughout the speed range using outboard motors from 20 to 40 HP, mounted either in a well inside the boat, or on the transom with a splash well. At low speeds she really shows her dory heritage with superb handling. There's none of the wandering that a deep-V hull exhibits. Consequently, trolling performance is excellent and she's just as maneuverable in reverse as in forward! Planing begins at about 8 knots, with a smooth, effortless, bow-down transition. A 25 HP motor on the open version will push her modern, efficient hull 20 knots. She'll do 25 knots with a 40 HP motor on the cabin version. Because the NEXUS 21' Dory is such an adaptable boat, available in both open and cabin models and with so many other options, she is popular for many different uses. People with waterfront homes find that her light weight, beachability, and large load capacity make her a waterborne pickup truck. Divers like the room, the dry ride, and the ease of getting in and out of the boat. Fishers like the unobstructed flat cockpit sole, the fuel economy, and our ability to customize the boat for their fishing methods. Families like the safety. Everyone likes the high standard of construction and amazing seaworthiness. The extensive option list lets you tailor your boat to your exact needs. Our system of building boats to order gives people exactly what they want. So here we have a sensible boat, a boat user's boat. It's no imitation automobile with carpeting and padded dash. The NEXUS 21' Dory is a real working vessel: simple, light, seaworthy, and beautiful. Build it yourself from our detailed plans or let us build it for you.